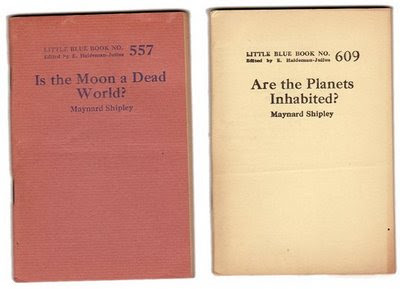 Little Blue Books are appealing because they look inexpensive, elegant, and mysterious. 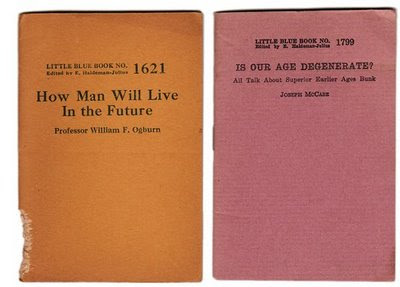 Little Blue Books are a series of small staple-bound books published by the Haldeman-Julius Publishing Company of Girard, Kansas (1919-1978). They were extremely popular, and achieved a total of more than 300 million booklets sold over the series's lifetime. Emanuel Haldeman-Julius, a socialist reformer and newspaper publisher, and his wife, Marcet, set out to publish small low price paperback pocketbooks that were intended to sweep the ranks of the working class as well as the "educated" class. Their goal was to get works of literature, a wide range of ideas, common sense knowledge and various points of view out to as large an audience as possible. These books, at approximately 3 1/2 by 5 inches (8 1/2 by 12 3/4 cm) easily fit into a working man's back pocket or shirt pocket. The inspiration for the series were cheap ten cent paperback editions of various classic works that Haldeman-Julius had purchased as a 15 year old (the Ballad of Reading Gaol being especially enthralling).